We went for round 2 this week. I've noticed a particularly disturbing trend. Mommy, ever the curious reporter, always asks me how my day was, how was my ride to school and what I did during the day. I like to keep this all a secret, of course, as do most babies (and later as teenagers), to maintain some privacy from my parents. However, lately mommy stopped asking. And now I know why: It is what I call The Spy Book! Every day I have been unwittingly ferrying to and fro, concealed in my backpack, a little black book. Okay, its more like an aqua-colored notebook, but nevertheless, this book, which shall heretofore be known as The Spy Book, is passed furtively from my parents to my teachers and then from my teachers back to my parents. I have been the courier of this notebook in which my teachers communicate secretly coded messages to mommy and abba and they write back. And, t make matters worse, it is all about me spilling all my secrets from the day in black and white. I found this out when one afternoon mommy, in unrestrained glee and impatience, read one of the entries aloud as we were at a red light on our drive home from Shalva. I was shocked and horrified! It contained ALL of my activities for the day including everything I ate, whether I took a snooze or a bottle or sneezed, who I played with and whether I drank from a certain cup or another. That is when it dawned on me - They are spying on me! I can't do anything without it being reported to my parents. Not only that, but my teachers provide photographic and video evidence of things I've done in school, as you see here in this blog. I am at an unfair disadvantage: While I can write these blogs fluidly, I still can't read. So I had no idea what was going on behind my back. 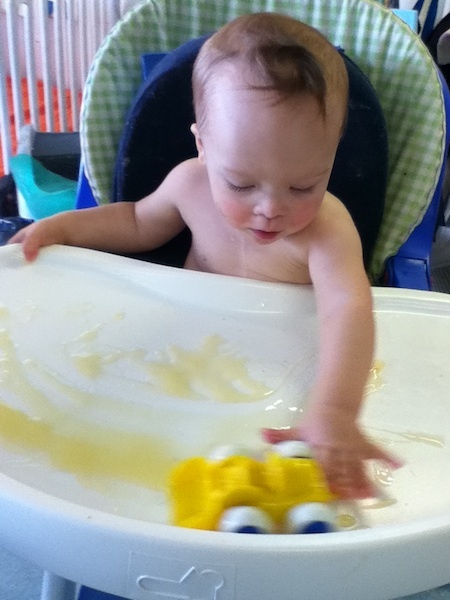 This daycare is more like secret service prep school - for my parents, that is. To top it all off, one day last week, mommy and abba had a secret meeting with the directors of the school and all of my teachers, therapists and girlfriends. They presented to my parents a multi-page report card with ALL of my doings from the beginning of the school year up till now and all their intentions for me in the next few months. And all of this occurred behind my back. Despite my vow of silence and need for secrecy, my privacy has apparently been shattered and my secrets exposed. 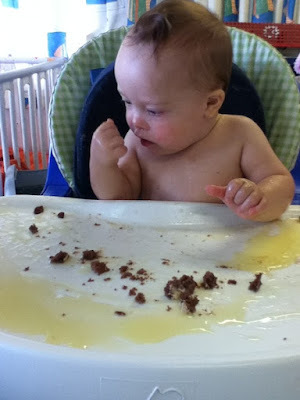 Now mommy and abba know that I do eat food with my own hands, even using my pincer grasp. 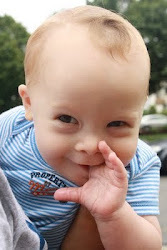 And now they expect me to do so at home, thus foiling my designs to remain a spoiled baby at home as long as possible. 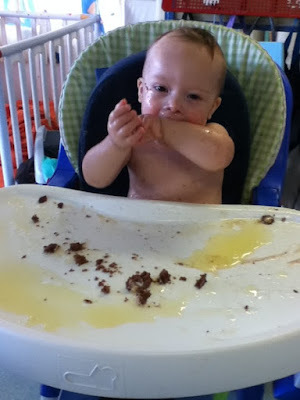 For example, the following series of photos contains proof of the hand-food issue. This is sort of like an unofficial part two of a prior, disastrous round of trying to goad me into using my hands to eat. Do you remember the pudding incident during my first week of school? If not, see this link for video footage of the catastrophe. They tried again, and this time I even got a little messy. Should this be considered progress? Or should it, as mommy cringes, be considered regression to a new level of baby messiness? Wow I am with your mommy....what a mess. 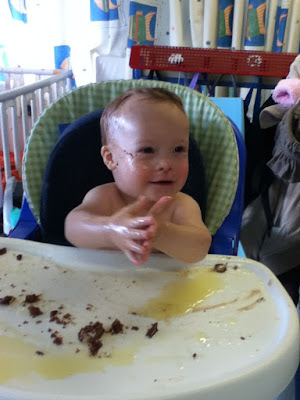 And Daniel that pudding looks like vaseline which can be quite messy..Elan has proven that to me. Glad that you can finally play with your food!! "D" for Delicious, "D" for Daniel … need I say more?